Easter Monday also happens to be April Fools Day this year. My carton of jumbo free range eggs has been giving me a double-yolked surprise every time so far, but here are a couple of great ideas where you have control over the end result. The method shown in this video results in a scrambled egg with a completely intact shell. All you need to mix up the insides is a long-sleeved T-shirt (or stocking) and some string or rubber bands. Cook to your liking afterwards (not necessarily hard-boiled) and no one will suspect a thing at the breakfast table! The Delicious Days blog gives a method for baking in egg shells. Other blogs use different types of cake, from a brownie filling to a red velvet one. 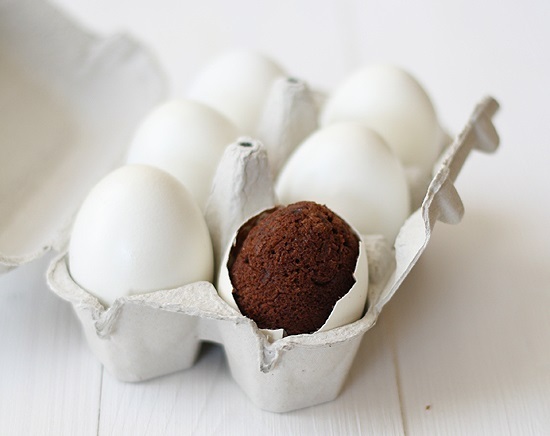 Brownie in egg shells from La Receta de la Felicidad. The Cupcake Project blog has a variation which even has a "yolk" piped inside before baking. You could also try injecting lemon curd afterwards, rather like a jam donut, but then you would have a little hole left in the cake. Potentially you could remove the egg shells and dip the egg-shaped cakes into white chocolate - then you could eat the whole thing, though admittedly it wouldn't look as realistic. 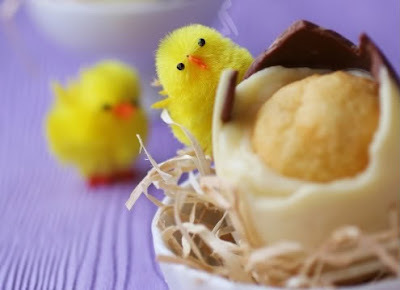 Another dessert you could make to look like eggs is cheesecake in chocolate egg shells. This does not require baking nor do you need real eggs (unless your favourite cheesecake recipe uses them). I guess an unsuspecting recipient is not so much going to think this is an egg, as that the chocolate egg will be hollow. Pudding with chocolate shell, from Gattina blog. Doesn't it look fantastic? And much more of a pleasant surprise than this. Actually, we managed to play a completely unintended prank on our house-sitter a couple of years ago. We had left a bowl of salted eggs sitting in our fridge. If you have ever had these before, you will know that if you crack them open before they are cooked, the whites will look like normal whites, but the yolk will be a solid sphere with an almost orange colour. I have no idea if our friend even tasted these before he threw the lot out. What about you? 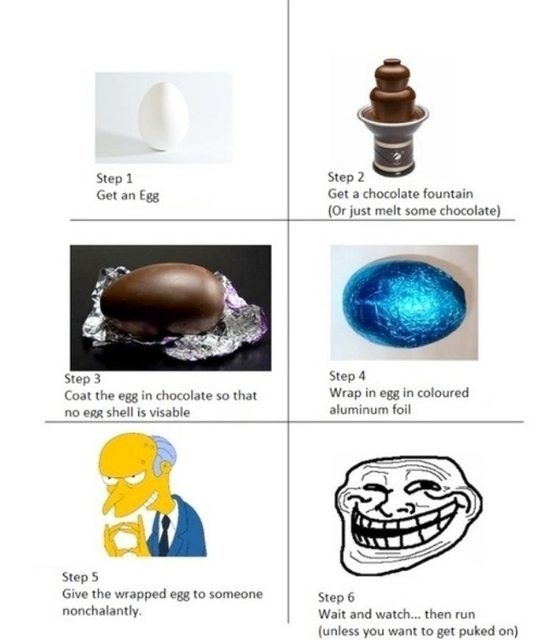 Do you have any eggy April Fool's stories to tell? Or do you have some tricks planned?